Church volunteers spend time caring for our church grounds. Though most lawn and bed services are under contract of a landscaping service, various areas need occasional weeding and flowers planted. 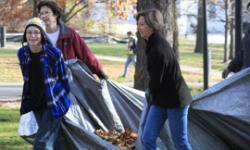 The annual fall leaf raking is a beloved tradition of fellowship, service, and Washtenaw Dairy donuts. If you are willing, when needed to extend care to the church grounds, help with leaf raking in the fall, or tend the Memorial Garden, this is a good volunteer opportunity for you. The Green Thumbers need help maintaining First Pres’ lovely grounds. They have divided the grounds into small areas (zones) and invite you to adopt one! Some zones require annual planting, some require trash monitoring and raking only. You choose and sign up to adopt the zone that suits you. 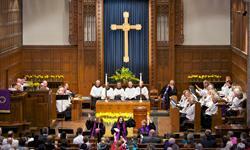 For example, Zone 1b is the area around the church sign. This area would take one person to maintain: rake, clean up debris, and trim the boxwood behind the sign. You would plant annuals in the spring (soon). We provide the plants, you put them in. And you check regularly to make sure that they are getting enough water. Zone 2b contains the patio, and requires only debris pickup and raking, no planting. Working on the church grounds is a meditative task that results in happy feelings! You may often run into old friends here! Please contact Kathy Clark at kclarkscio@comcast.net or Kathy Sample at 846-4080 to ask about a zone.